The H&M buys, finally! I have to be quick here because schoolwork is seriously drowning me, but I'll get back to your comments when I have time to breathe, okay? Great. 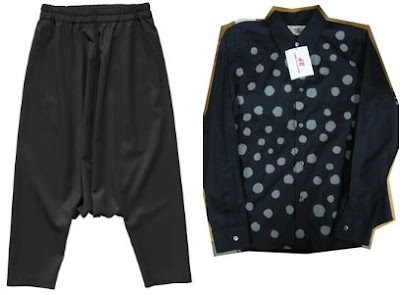 I bought the wool drop crotch pants and splotchy dotted button down, though they will be going up on eBay. Hopefully they sell and I will then be able to order the jacket that snarky ugly man took from me. I will forever hold a grudge against him and I hope it doesn't fit and that he was attacked by a bear on his way home that stole his jacket. I am not spiteful, malicious, bitter, or malevolent. Not me! Not one bit! 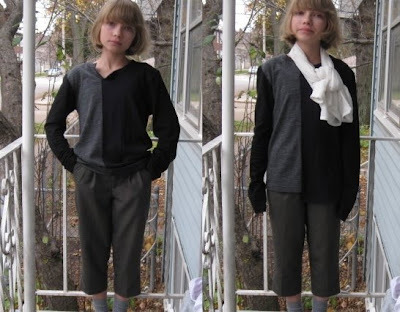 I did keep one thing for meself, and that, my friends, is the two tone choppy wool long sleeve shirt. It's so warm and cozy, and I love how the collar is so uneven. I wasn't a fan of most of the polka dots in the collection, other than the more interesting dots like the ones above and the ones on the men's shirts that looked like they were drawn by a blind 5 year old. It seemed like they (whoever they may be) just decided to take basics-like a simple solid colored long sleeve shirt wtf-paint on a bunch of polka dots and give it a label. Bada bing, bada boom! MONEY! 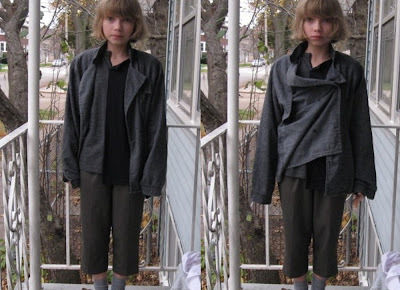 Here it's simple, with some thrifted trousers and a white sheer top I'm wearing as a lumpy scarf. 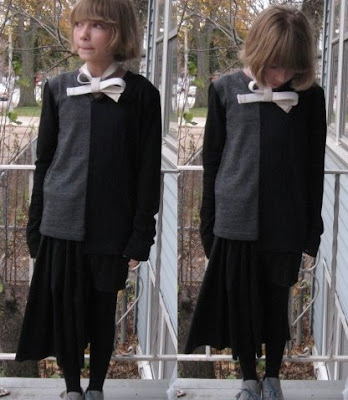 With my thrifted schoolgirl skirt, white belt tied as a bow scarf thingymajigger (oh how wide my vocabulary is) and metallic tin man/sputnik/robot/buzz lightyear jacket. The tights I got on Thursday too, SOMEHOW the ones I bought at Walgreens for a dollar got giant holes and runs in them so it was time to buy a new pair. When I wore my holey ones to school a few days ago, a teacher said, "Tavi, you should ask your parents for a raise on your pantyhose spending!" Ew. Probably the only time I'll take a teacher's advice. Again, I am not bitter. What I finally ended up wearing. My black pencil skirt and cape tied on the side. I wore this to my friend's house yesterday and her brother actually asked if I had sewn two shirts together. And the shoes I'm wearing in these photos. Tao-esque boots and fake vans from 6th grade, when I was all OMGZ CONVERSE VANS IPOD COMMERCIAL SONGS. Rei does these kinds of shoes a lot though, and now I finally have ideas of ways to wear them, other than OMGZ SKINNY JEANS AND A HOODIE. Though I don't like the red, I think I'll color them with black sharpie? Or something? God I wanna watch that movie right now. She said she read my blog, put you hands up in the air! You're the sweetest person ever, thanks for saying hi to me! But I got out alive as a soon-to-be ebay seller! No one in class got swagga this cool!